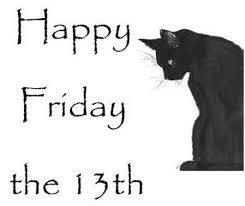 Well for our July event it will take place on Friday 13th July – we are not superstitious and hope you aren’t either! We are planning weather permitting to make it an alfresco meal down the bottom of our garden – please note if weather is too unsettled it will be done indoors. We will kick the meal off with a welcome dink and nibbles of a seasonal nature and then serve as a first course a homemade coarse terrine that will incorporate pork and chicken… I love making a terrine as there is a skill to keeping it moist and full of flavour and it always excites me when I cut into it for the first time. I will serve it with a homemade butternut squash & cranberry chutney that has been maturing now for a good while! Next a challenging dish for some will be a Ceviche of sea bass and salmon. This is raw marinated fish served with a thinly sliced salad of fennel. The addition of mint in the Ceviche also adds a zing to the citric marinade that cooks the fish. Perfect for a summer evening. The main course will be roasted beef fillet served with a “Pepper Club” sauce – this is a piquant green peppercorn and port soaked raisin cream sauce – we will serve some fresh green beans (as always) and pommes dauphine little deep fried mashed potato and choux pastry pillows… perfect to mop up the sauce. Finally we will basically serve a jelly & ice cream dessert that will showcase Marden based cider makers Phil & May Turner and specifically their elderflower cider – we will also stud it with fresh local raspberries and when we serve it some homemade strawberry parfait and warm butter shortbread biscuits. Well, we could not have planned our latest round of dinners any better… it was some thought foolhardy to try and host two dinners back to back “up the garden” totally alfresco. It was ambitious on many levels as we had to transport food from the kitchen across the decking down to the bottom of our long garden. As we monitored the weather, prior to the dinners, we were pleased to see there was a predicted heat wave on its way and so the fears of being rained upon or being unseasonably chilly were forgotten and we readied ourselves. The menu we put together was one we had devised for an aborted “pop up” in a lavender field .Too good to not offer to our guests and so we decided to run it at our own secret venue. The day arrived and the sun shone. We readied our patio with gazebo and the fire-pit was all stoked up. It was a gorgeous evening with warmth lingering as the sun set across the patio. The Friday night was a more genteel evening for us as we only had six diners in total, as guests arrived we then realised it was to be a bit of a wedding anniversary fest as one set were celebrating 40 years each and the other was a mere “whipper snapper” at 27 years! We served up our welcome drink, a glass of kir royal, and our nibbles were little shot glasses of chilled fresh asparagus soup, butter popcorn dusted with smoked paprika and some slices of Catalan Fuet Salami. So the meats we then cooked on the fire-pit were rumps of Lamb that had been studded with garlic and rosemary, boneless chicken thighs were marinated in garlic, olive oil lemon juice and chopped thyme. Some wonderful thick Magret de Canard (Barbary Duck Breasts) and then sausage were turned with regularity to ensure an even cooking and then at the last minute we placed some large shell on king prawns to grill. All this was served with our chosen salads – Green Bean with toasted pine nuts, Cherry Tomato with thinly sliced red onions Olive Oil Baslamic Vinegar and Fresh Basil and a grated carrot with an onion and roasted cumin dressing for a bit of a kick. Pots of homemade aoili were provided to accompany the prawns & meats. Bowls of butter minted boiled new potatoes were also served. Guests tucked in on both nights to a veritable feast and much praise for the lamb and duck breast. In fact there was little left over as we cleared plates away in readiness of our next course. In true French fashion we served our cheese selection. A local cheddar cheese and favourite… Winterdale Shaw from Wrotham Hill – now a totally carbon neutral cheese- was served alongside a piece of Stichleton an unpasteurised “Stilton” cheese and then a piece of fresh goats cheese that was served with some of our homemade banana jam and our veritable Porridge oat biscuits. 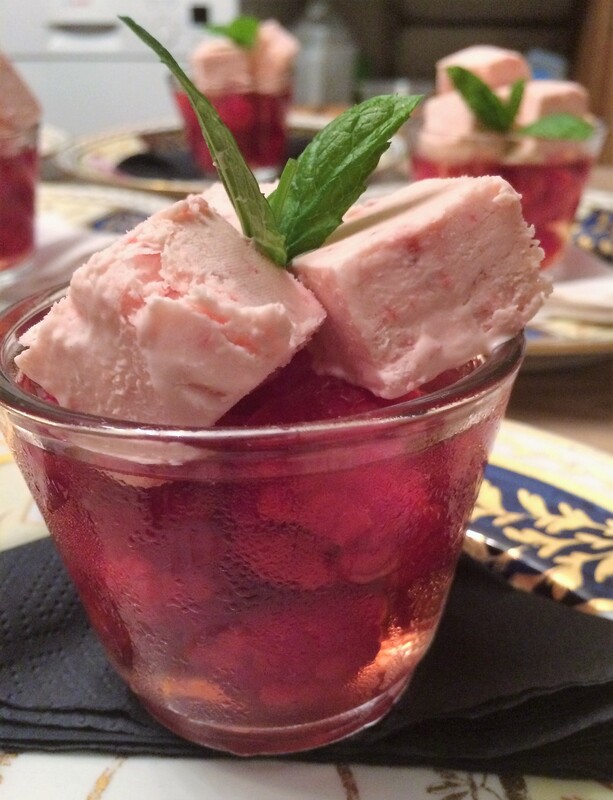 The final course served was a melee of summer fruits, Local Strawberries, Raspberries, Cherries and Blueberries served with a scoop of earl grey & lavender sorbet and also some of our homemade strawberry parfait. With a freshly baked shortbread biscuit that was topped with some foraged meadowsweet pollen sugar it made an interesting combination with a glass of our Muscat de Rivesaltes dessert wine. As the light faded on both nights and the evening temperature cooled we lit the garden with candle bags and fairy lights and guests conversations ebbed and flowed. It was a really magical atmosphere that seemed to have all leaving enthused by the experience and the comments afterwards in our guest book and by some of the guests on twitter were much appreciated. and from @Leilanimitchel – AMAZING evening at @MrHariCovert s secret restaurant, a birthday surprise for @mark_head, the surprise was its not his birthday for ages! It was a tough couple of nights for us as we had to lug all the food up and down the garden and we had a total of 16 guests on the Saturday night and it was a very hot night as well so I must say a big thanks to my helper Julia… she is the unsung hero behind all my events as she has to put up with my mood swings and tantrums as we battle to give the guests a secret adventure to remember! In between our two nights was also an event I was keen to support and glad I did. A regular attendee and patron of Hari Covert’s is Laura Goode who was behind the Tunbridge Wells Food Swap. The idea was to grow it, make it and then swap it! There was to be a clandestine meeting of like minded foodies scheduled to be like a flash mob in central Tunbridge Wells on Saturday 13th July at 11am when we would all bring along our chosen foods to swap with others. Well I had arisen early Saturday to make up two loaves of fresh Moodley’s Beer Bread to go with already packaged up jars of Strawberry Coulis and a couple of jars of Strawberry Jam, and bags of Porridge Oat biscuits with little bags of my salt & pepper mix and a recipe sheet to have a go and make some of their own! It was great fun to see what I could swap and I must admit I was delighted with my haul of a lovely fresh baked sour dough loaf made by @JPJanetPenny that went down well with my Saturday night guests and the little chocolate and almond petit fours by @sunnyingrid were also well devoured by my guests. A gorgeous Lemon Drizzle Cake (thanks Sharon) and some of Mike Goode’s Welsh cakes with a cup of tea were also much appreciated. I have yet to sample @TunWellsFoodie Chilli Jam and Laura’s Sun Dried Tomato and Almond Pesto and then Adele’s Spiced Plum Chutney – it was a great simple idea and I urge all fellow foodies to sign up on the web site here and look out for the next one which I think is scheduled for sometime in September – they also have a Facebook page and twitter profile so make sure you follow them if not already doing so! So it was a real scorcher of a weekend… we are now taking a break till September… we hope to see you sometime soon and please keep checking our site for the latest posting or why not sign up to get our regular newsletters. Have a fun filled summer break… we will ! PS some of the photos are by Leilani who was a guest on Saturday!